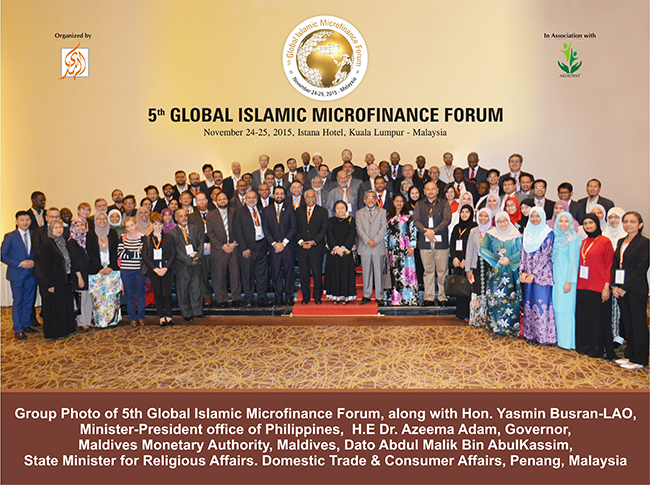 (3rdDecember, 2015 – Lahore) Under the benefaction of AlHuda Center of Islamic Banking and Economics (AlHuda-CIBE) and Akhuwat, the 5th Global Islamic Microfinance forum (GIMF) held in Kuala Lumpur, Malaysia which was attended by the officials and delegates from 30 countries including Pakistan, Nigeria, Tajikistan, Canada, Tanzania, Philippines, Indonesia, China, Azerbaijan and many other countries. The entire leadershipunanimously unified their voice and support for the development of Islamic Microfinance for poverty alleviation, social development and financial inclusion. The forum had their focus on financial inclusion, outreach strategies of Islamic Microfinance, Innovation and sustainable operational strategies with emphasis on linkages, institutional support, cross boarder knowledge sharing with practical experiences and donor linkages for the development of the Industry. Hon. YasminBusran-LAO, Minister/General Secretary, National Commission on Muslim Filipinos (NCMF), President office of Philippines, H.E Dr. Azeema Adam, Governor, Maldives Monetary Authority, Maldives , Dato Abdul Malik Bin AbulKassim, State Minister for Religious Affairs. Domestic Trade & Consumer Affairs, Penang, Malaysia, Dr. Amjad Saqib, Chairman, Akhuwat and Muhammad Zubair Mughal, CEO, AlHuda CIBE were among the distinguished dignitaries and participants in the said forum. Addressing to the inaugural session, the Chief Guest of the Ceremony Hon. YasminBusran-LAO, Minister/General Secretary, National Commission on Muslim Filipinos (NCMF), President office of Philippines said: Islamic Microfinance should be utilize as system of poverty alleviation for Muslims and Non- Muslim world, she pursued the participants “There are various challenges among the Muslim World, but if we look at our figures we can see the opportunities therein. Islamic Micro financing is a catalyst to empower our SME’s and a viable and sustainable vehicle for inclusive economic growth” The Guest of Honor at the Forum,H.E Dr. Azeema Adam, Governor, Maldives Monetary Authority ( Central Bank), Maldives, appreciated AlHuda CIBE efforts for the development of Islamic Microfinance concept globally, she gave detailed overview of Maldives Monetary Authority for the development of Islamic Microfinance and other Islamic Financial components under her auspicious leadership, she mentioned that Two Islamic Banks & One Takaful company are already working in Maldives and demand of Islamic Finance products is increasing rapidly. While addressing to the Participants of the Forum, Dato Abdul Malik Bin AbulKassim, State Minister for Religious Affairs. Domestic Trade & Consumer Affairs, Penang, Malaysia emphasized the role of Islamic Development Bank for the development of Islamic Microfinance industry in Muslim world for poverty alleviation and economic development, he also believed that Halal cottage industries can be developed through Islamic Microfinance which will give employment and trade opportunities to under privileged people and will also prove useful for the development of Halal industry. Dr. Amjad Saqib, Chairman Akhuwat highlighted the ways of poverty alleviation through Qard-e-Hasan in Islamic microfinance through which Akhuwat is providing small loans to more than 3 lac people across Pakistan. He further added that poverty is a world phenomenon and mostly growing in the Muslim countries. It is recommended that we chalk an international strategy to alleviate poverty from Muslim world through means which could be closer to the Islamic traditions and religious norms and Islamic microfinance is the best solution for that. He presented the Akhuwat Model as a successful case and declared that Akhuwat has so far distributed almost Rs.9 Billion among 980,000 families through “Qarz-e-Hassan” which in itself is a true model of Islamic andWelfare oriented Microfinance system. Addressing to the participants, the organizer of 5th Global Islamic Microfinance Forum, Mr. Muhammad Zubair Mughal, Chief Executive Officer, AlHuda CIBE said that there is no religion of poverty but it can be alleviated through methods defined in the religion and Islamic microfinance is the best example forit. Not only Muslims butNon-Muslimsalso, can benefit equally from micro financing system of Islam. He added that Muslims are highest in financially excluded community in the world and poverty is rapidly increasing to its dangerous level. The main reason of this is the non-availability of such financial products which work in accordance with their religious and social believes. 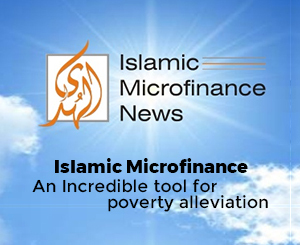 Islamic Microfinance can be utilized as an ideal instrument for financial inclusion to address the poverty problems in right mode. He also announced that 6th Global Islamic Microfinance will be held in Kenya in October, 2016. The Forum continued for 4 days wherein Sharia’ah Structuring for the development of Islamic microfinance, role of IT, Micro Takaful, Sustainability, crowd Funding and the issues related to zakat and Awoqaf were discussed in a broader perspective. AlHuda Center of Islamic Banking and Islamic Economics (AlHuda-CIBE) is a recognized name in Islamic banking and finance industry for research, advisory and capacity building for over ten years. The prime goal has always been to remain committed and provide state-of-the-art Advisory Consultancy and Education through various well recognized modes viz. Islamic Financial Products Development, Sharia’ah Advisory, Training Workshops, and Islamic Microfinance and Takaful Consultancies etc. Side by side,through the distinguished, generally acceptable and known Publications in Islamic Banking and Finance, dedicated to serve the community as a unique institution providing Services not only from UAE and Pakistan but all over the world. AlHuda-CIBE r served in more than 25 Countries for the development of Islamic Banking and Finance industry so far.